Paddington takes a bath…and the bathtub on a ride down the staircase. Paddington is an?awesome, hilarious and just fun movie that will make you feel like a kid again. (Even though I’m still a kid.) It all centers around Paddington. a marmalade-loving bear from Peru, who travels to London to start a new life. At Paddington Station, a family called the Browns agree to take him into their home. There is a taxidermist who wants to stuff Paddington. 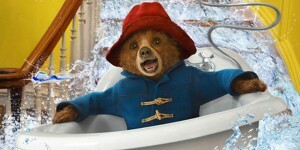 My favorite part is when Paddington first encounters a bathroom. All the crazy chaos that ensues made me laugh and hopefully you’ll laugh too. My favorite character is Paddington the Bear, so happy and bright and gets out of the stickiest situations in the funniest ways. One of the reasons Paddington is wonderful?is that the film brings together?a great cast including Sally Hawkins and Hugh Bonneville. The writer has spun a great screenplay that gives each character enough development. 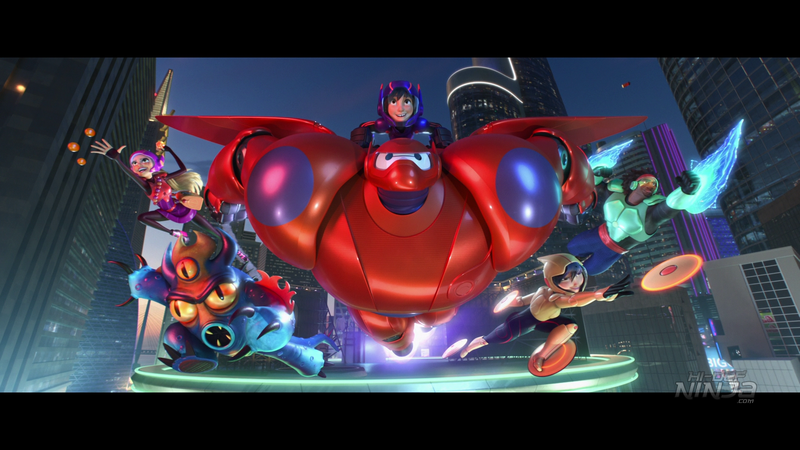 The Big Hero 6 team storm the streets of San Fransokyo. 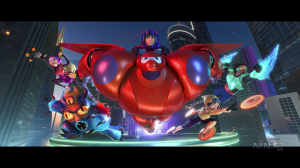 Big Hero 6?is an amazing, hilarious, action-packed, beautiful Disney film. Big Hero 6 is about Hiro, a robotics prodigy who instead of going to college goes underground “bot” fighting in the back alleys of San Fransokyo, a bright colorful noisy metropolis. Hiro’s brother, Tadashi, shows him his school, the San Fransokyo Institute of Technology, what his friends are creating and Baymax, a huggable medic robot that can care for patients. Immediately Hiro wants to go there. He wins a contest to go to the college by inventing microbots, an army of tiny simple robots that their creator can control and can form any structure. After the contest tragedy strikes. Tadashi dies and the microbots are stolen. Hiro is depressed until Baymax comforts him. Together they go to try to stop the man who stole the microbots. I’m a sucker for superhero movies so this was one my most anticipated movies of the year. You should definitely go see it because it has a captivating story, beautiful animation, great 3D effects, and all around a fantastic film. Maleficent (Angelina Jolie) causing mayhem with her feathered sidekick. I loved Maleficent, or as I call it Magnificent. I went to see it in 2D (sorry, no IMAX or 3D review) and was pleasantly surprised by this film because I did not expect the movie I got. 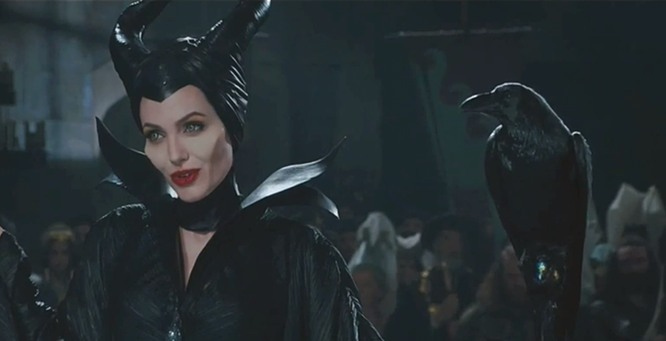 It was an origin story for Maleficent, the villain from Sleeping Beauty. It shows what drove Maleficent to do the things she did in?Sleeping Beauty. The previews promoted it as a really dark movie but it has some?surprisingly light scenes and you start to root for Maleficent, even though she did some very bad things. Angelina Jolie does a fantastic job of portraying a hard character. She is not 100 percent evil but she is not 100 percent good either. You feel her pain. Sam Riley plays Devon, a man who can turn into any animal and Sharlto Copley is the evil King Stefan. The fairies bring most of the laughs. I recommend this movie to kids ages 6 though 10 because there are some scary images and scary battle sequences and even I got a little scared. The second installment in the Captain American franchise is a great film! It has great characters that get enough to do in an action-packed movie with a pretty good story and heart-pounding action sequences. It has a new formula for superhero movies because it is almost a spy thriller. There are some good performances such as Chris Evans, who shows a different side of the character. Captain America is experiencing the present and he’s sad and kind of lonely. Everything he knew in the past doesn’t really exist anymore. Samuel L. Jackson does a good job in the screen time he gets. The direction is well done by Anthony and Joe Russo because they brought a new political thriller feel to the movie. I did have a minor issue with one the story lines with the creepy computer but otherwise the other story lines are good. Captain America: The Winter Soldier is a great superhero movie and it makes me look forward to further installments in the franchise. Patsey protecting Solomon Northup in the only clip I saw from 12 Years a Slave. It?s that time of year to see our favorite movies win awards. This year I had a problem. I couldn?t see any of the movies because all of them were PG-13 or R. So I looked through the nominees, I read reviews in Entertainment Weekly, read about past winners and I made some predictions. This is what I came up with. Best Animated Feature: I can actually see these movies. Except for The Wind Rises, which is PG-13. Frozen?will probably win because Disney movies usually win. I saw Frozen?and I really liked the music and the story. It had great characters. Best Animated Short: I saw all of these movies. I think Get a Horse will pull Disney fans to the ballot or Mr. Hublot for those people in France and science fiction/future fans. My pick is Mr. Hublot because I really liked the world they created. Best Actress: Easily Cate Blanchett will win for her role in Blue Jasmine because Ann Hornaday and Entertainment Weekly think she will win. Ann Hornaday is the Washington Post film critic. Cate Blanchett also won the Golden Globe. If you win a Golden Globe, it usually means you might win at the Oscars. The ensemble (assembly required) face a hairy moment. 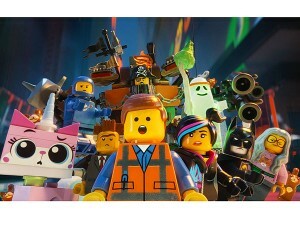 The Lego Movie is a fantastic, funny, creative adventure. I love the voice actors in this film. It is about an ordinary Lego figure named Emmet (Chris Pratt) who has the piece of resistance, an ancient relic that includes a prophecy that could stop Lord Business’s plan to destroy the universe. He meets Wyldstyle (Elizabeth Banks), Lego Batman’s girlfriend and Emmet has a crush on her. She is the film’s heroine. He also meets Vitruvius (Morgan Freeman), an awesome wizard who helps him with the prophecy and his awesome journey to save the universe. My favorite part is when we first meet Benny (Charlie Day), the spaceman at the meeting of Master Builders at Cloud Cuckoo Land. He’s my favorite character. The Lego Movie is one of the best movies of 2014 thanks to its wonderful story, great characters, and awesome ending. Anna and Kristoff meet Olaf the snowman. Frozen is about two sisters Elsa (Idina Menzel) and Anna (Kristen Bell). Elsa has the power to freeze stuff, which keeps Anna and Elsa apart when they were young because once Elsa accidentally hurt her younger sister with her powers. One night when they are older, Elsa gets scared during her ceremony to become queen after her parents die. She freezes the kingdom of Arendelle on accident. Then Anna sets off to find Elsa and tell her to thaw the kingdom. On the way she meets Kristoff (Jonathan Groff), his reindeer Sven and a snowman named Olaf (Josh Gad). The music is spectacular with songs like In Summer, Let It Go and Do You Want to Build a Snowman. It is hard to tell which song will get an Oscar nomination. If you have already seen Frozen in 2D, go see it again in 3D. The 3D is amazing. 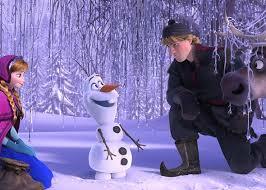 My favorite character is Olaf because he’s really funny. People will like this movie because it’s funny and it’s a good story. The reason I love?Frozen?so much is because it’s really magical. Reggie and Jenny share a moment in the forest. Free Birds?is about two turkeys Jake (Woody Harrelson) and Reggie (Owen Wilson) who go back in time in a time machine named Steve (George Takei) to stop the first Thanksgiving. They want to try to get turkeys off the menu. Then Reggie falls in love with a turkey named Jenny (Amy Poehler). The characters are likable. The story is cute. The comedy and animation is okay. This movie is appealing to ages five through nine. I don’t think 12 year-olds would like a movie about turkeys going back in time because they probably would think it’s weird. I think boys and girls will like this movie. Jenny gets a lot of screen time and I think boys would like it because of the humor. 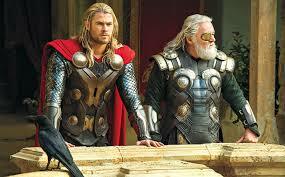 Thor and Odin look out over their kingdom of Asgard. Thor: the Dark World is surprisingly great for its genre. I didn’t think it was going to be as good as Captain America or Iron Man. I found myself laughing when they had references to other super hero films. Thor: The Dark World starts when Thor (Chris Hemsworth) is restoring peace in the nine realms. Then we catch up with Jane Foster (Natalie Portman). She is trying to get her life back together after Thor left. She is still a scientist and trying to find a date. She meets three kids who find this special type of force and Jane disappears into another dimension and touches something called the aether, which puts dark matter into her. That’s bad because she could die or become evil. Meanwhile, somewhere in the nine realms, Malkeith–King of the Dark Elves–has a plan to attack Asgard, the world Thor inhabits. (Asgard is fake anyway, it’s not really a planet. If you get a science test on the solar system, you’ll probably fail if you put down Asgard.) Then Thor has to try to fight the dark elves and save Jane Foster. He goes and gets his brother Loki (Tom Hiddleston) to help him. There are great special effects, especially the parts on Asgard. Malkeith (Christopher Eccleston) is a great villain. If you’re ?a Thor fan, you will love this film. 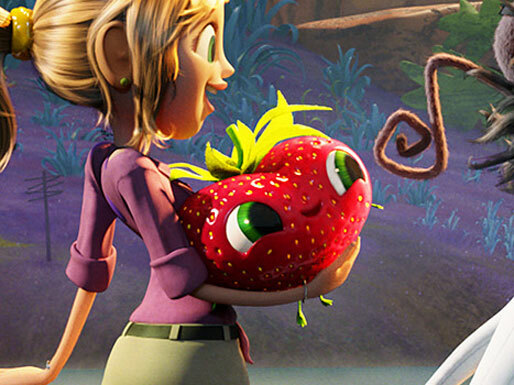 Sam Sparks (Ana Faris) totes around the “berry” cheerful Barry. In the sequel to 2009’s hit Cloudy with a Chance of Meatballs, Flint Lockwood (Bill Hader) and the gang are assigned to go back to Swallow Falls by Flint’s hero, Chester V, after a cleanup goes horribly wrong. When Flint made the food machine in the first movie, it left a bunch of food destruction that they hadn’t cleaned up yet. When Flint goes back to Swallow Falls, he finds a bunch of animals that his food machine made but they’re kooky food animals like tacodile, cheese spider and shrimpanzees. Chester V is Flint Lockwood’s childhood hero and he seems all nice and scientific, but inside he’s different. My favorite character is Barry (Cody Cameron). He’s so cute and funny. Maybe leaving Saturday Night Live wasn’t bad for Bill Hader. He’s really good in this movie. I like the 3D animation. The foodimals look realistic. There are some funny but sometimes gross jokes in this movie.